The track in Missouri is very demanding. We brought a new truck this year and man did it pay off. We had fast laps, a top qualifier and a race win… all made possible by the rubber hitting the road. Our Toyo tires took us to victory… our 73rd win in Pro 4. All on Toyo Tires. WHEATLAND, MO – Kyle LeDuc and Toyo Tires won Round 4 of the Pro 4 Class in the Lucas Oil® Off Road Racing Series at the Lucas Oil® Speedway in Wheatland, MO. LeDuc, driving his #99 Monster Energy / Toyo Tires / WD-40 Ford truck, began the weekend by qualifying fastest, later winning Saturday’s main event overall. His truck relies on Toyo Open Country M/T-R tires to help deliver his wins. The off-road course at the Lucas Oil Speedway is 1.2-miles in length and has nine turns, including an “over and under.” It is considered the longest track on the circuit and challenges drivers with a combination of clay and dirt. Also, during Round 4 on Saturday, Brandon Arthur finished in second in the Pro Lite class driving his #6 MAV TV / Toyo Tires Chevrolet truck while running Toyo Open Country® tires. During Sunday’s Round 5, Team Toyo’s newest member Jerett Brooks, finished on the podium in second driving his #77 RIGID / Toyo Tires / KMC Wheels Ford truck on Toyo Open Country M/T-R tires. Kyle LeDuc and Toyo Tires have won five Pro 4 Class championships in the Lucas Oil Off Road Racing Series since 2012. His last four championships were consecutive through 2017. 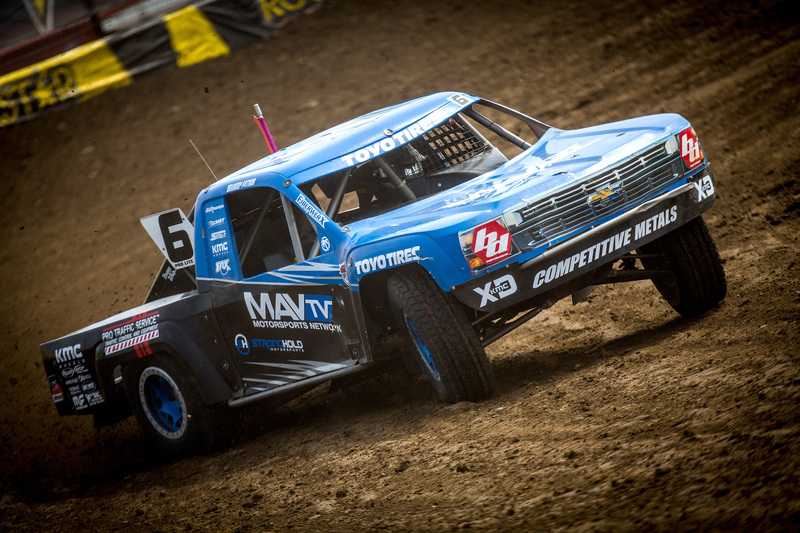 The 12-race Lucas Oil Off Road Racing Series can be seen on CBS, CBS Sports Network and MAV TV. Log on to www.lucasoiloffroad.com for race highlights and for schedules of television coverage. Learn more about the full line of race-proven Toyo Open Country tires at www.toyotires.com.